Alison Verret practices in a broad range of civil litigation with an emphasis in research and writing in complex litigation. She has handled research and writing tasks in many types of cases, including automobile product liability, eminent domain/condemnation, medical device product liability, employment, commercial, premises liability, and asbestos litigation. 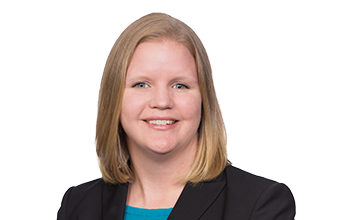 Alison also has experience managing and assisting litigation related to pipeline construction, including eminent domain/condemnation and tort litigation. Alison’s briefing experience includes submissions to courts at all stages of litigation, including appellate submissions to the Oklahoma Supreme Court and the Tenth Circuit Court of Appeals. She routinely drafts or assists with drafting motions to dismiss, discovery motions, motions for summary judgment, Daubert motions, motions in limine, trial briefs, jury instructions, and appellate briefs. Alison devotes a portion of her practice to administrative compliance matters. She represents clients in agency enforcement actions, including Occupational Safety and Health Administration (OSHA) and Mine Safety and Health Administration (MSHA) actions, and provides assistance with regulatory compliance issues and records management and retention. Alison’s achievements have earned her inclusion in Oklahoma Super Lawyers’ list of “Oklahoma Rising Stars,” which recognizes the state’s top up-and-coming attorneys. Represented Enbridge Energy in all of its condemnation cases in Oklahoma associated with its Flanagan South project to obtain necessary easements for major oil pipeline crossing multiple states, as well as other landowner suits related to project. Assisted a construction company in contesting an OSHA citation. Assisted a local quarry with contests of MSHA penalties. Assisted a pipeline company with update of records retention policy and schedule. Drafted motion for summary judgment on behalf of grocery store that resulted in voluntary dismissal of the plaintiff’s claims against the store. Handled briefing and argument on appeal to district court and was able to obtain a more favorable ruling regarding wages due for an employer on remand to the Oklahoma Department of Labor. Provided research, briefing and trial support, including drafting of jury instructions, trial brief, and motions in limine, in a case in Mayes County, Oklahoma, in which a defense verdict was obtained in favor of a loss prevention investigator who was an employee of a shoe retailer. The case involved allegations of wrongful termination, kidnapping, false imprisonment, coercion into signing documents under false pretenses, and falsely procuring a person’s signature. Drafted successful motion for summary judgment for an automobile manufacturer in a products liability case pending in federal district court. Drafted successful motion for summary judgment in favor of an employer in a case involving allegations of respondeat superior and negligent entrustment. Research and briefing associate on a successful appeal in the U.S. Court of Appeals for the Tenth Circuit that affirmed judgment in favor of corporate timberland owner in an action involving claims of trespass by the landowner and claims of adverse possession made against that owner. Research and briefing associate on a successful appeal in the U.S. Court of Appeals for the Tenth Circuit that reversed a dismissal by the trial court in an action seeking to enjoin state court proceedings pursuant to the Anti-Injunction Act. Provided legal advice to a national telematics service provider regarding potential liability exposure arising out of contracts to provide emergency medical services, including emergency medical dispatch and pre-arrival instructions, through satellite and cellular technology installed in automobiles. Provided legal advice to a national telematics service provider regarding state and local emergency medical services statutes, regulations and relevant case law in all 50 states. Drafted motion for summary judgment on behalf of component part manufacturer in a products liability case that resulted in voluntary dismissal of the plaintiff’s claims against the manufacturer. Drafted motion for summary judgment on behalf of a product manufacturer involving the economic loss doctrine and statute of limitations issues that resulted in voluntary dismissal of the plaintiff’s claims against the manufacturer. Drafted motion for summary judgment for manufacturer in asbestos litigation that resulted in voluntary dismissal of the plaintiffs’ claims against the manufacturer. Briefed interlocutory appeal to the Oklahoma Supreme Court involving interpretation of statutory penalties under the Oklahoma Franchise Tax Code.